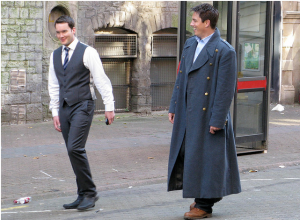 of trying, trying, trying to get over Ianto dying. Slowly weeding out any fan fiction with canon-compliant story lines, Jack mourning, Jack remembering in the future. Can't go there. Can only read happy endings. I've not been this devastated when actual real-life people I've known have died. What is wrong with me? Fortunately, there is a lot, I mean a lot, of positive outcome, happy Jack and Ianto, alien-fighting while having a good life together fan fic. Thank you, authors. I remember playing 'Dead Summer' by Unblest over and over and over til I had to force myself to stop listening. Never been so immersed in misery and sadness. Much better now, thank goodness, but still reading Janto fan fic every single day. I don't even worry if I'm crazy anymore. I am just so grateful to fan fic authors. She has all the character traits I despise and none of the ones I admire. If there was a prise for creating the most dislikeable non-villain ever, RTD would've won hands down. He would also, of course, be completely baffled because, in the quaint British idiom, he thinks the sun shines out of her arse! No more so than me. I have thousands of icons and other pictures saved, I've got all the audio dramas and most of the novels despite how crap a lot of them are, almost all the magazines, the DVDs, and every fic I can get my hands on except for the Gwen-centric ones. RTD is a poor writer because he can't adapt his idea to take audience reactions into account. He thinks that he has to stick slavishly to his original idea and that his vision is perfect. No one else's opinion has any validity for him. Do you have your own Hysterical Woman number? I don't think I have a number. I must have missed that bit. I agree about the books. They were pretty lame, over all. Sometimes I think the author had never even seen the show. I've read much better fan fiction. You completely out-do me in the obsessiveness. I have the books on Kindle, one Torchwood book that I forget what it's called, but it's not a dictionary. I'm very tired today, and my brain does NOT work well when I'm tired. Sometimes I'm lucky I get the first letter of the word I want correct. Like disposal instead of dishwasher, hey, I got the first letter right. LOL I think the only audio drama I have, beside Broken, is The Sin Eaters, that I downloaded in parts off of some site somewhere a long time ago. Oh, and I heard, but not sure I saved, the last Big Finish that was just Ianto in the plane. I haven't listened to the Big Finish audiodramas, I need to find time. I'm bad with words sometimes, calling the wardrobe a greenhouse and stuff like that. I don't even get the first letter right. I'm tired right now, busy day, trying to get some things sorted out around the house so I can get more stuff out of storage. More to do tomorrow, but I'm off to bed now. Storage. We have so much stuff we have to store some of it. I'm lucky, the only time I've had to use storage was when I was homeless and staying with friends. I try to get rid of stuff as I go along. Give it away if at all possible. My homemakers are good for that. If they don't want it, they probably know someone who can use it. When I first moved after my husband left, OMG is all I can say. We had a full basement, and it was full. The trash man was happy. He would go through my trash every week and pick out stuff. Made him late for everyone after me, but I was just happy the stuff was going to get used. I hate just tossing good stuff, but sometimes I just don't know what else to do with it. I'm very wordy today, Sorry about that. It's one of those everything is going on at once, and I haven't even gotten to eat my breakfast yogurt yet, and it's after noon. Hyper R US. I'm like that at the moment, trying to sort things so my shelf unit can go back against the wall. I do a pile of sorting after I get up, and don't get my breakfast fruit and yogurt until at least 11am. Still so much to do. My stuff went into storage when pipes burst back in 2010. Now I want to get then back because the unit leaks and costs a lot every month. Anything I don't want goes to the local charity shops, so at least someone can get use from it. There's a lobby downstairs, and sometimes people (me,too) put stuff down there for anyone who wants it. Handy. I always have trouble figuring out temperatures, but I understand it wasn't as cold as it should've been so yay for getting it replaced! Everything will stay properly cold again once the new one is in place. Hope the delivery goes smoothly! Thanks. I'm hoping it goes well, and they don't show up at 7am or something. Mornings R NOT Us. I had a delivery coming and was told between 7am ans 7pm, so I got up before and the delivery arrived after 6.30pm. So unfair! May yours arrive late enough that you're awake and ready, but early enough that you're not waiting all day. Thanks. That is so annoying, waiting all day, isn't it? Especially if you've had to get up early and miss out on sleep >.